"Listen carefully, my son, to the master's instructions, and attend to them with the ear of your heart." Benedict called his Rule, "a little book for beginners," and he covers such disciplines as obedience, humility, contemplation and living in community. 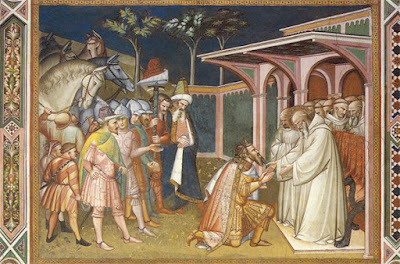 Yet he first introduces us to four types of monks, the cenobites (belonging to a monastery and serving under an abbot), the anchorites or hermits (having lived in a monastery for a long time and their zeal for the monastic life has cooled), the sarabites (detestable monks who have "a character as soft as lead", and are captured by worldly delights, a law unto themselves), and gyrovagues (drifters who are captives to their own selfish desires). His rule is to assist the first class of monks. "....... He must hate faults but love the brothers. When he must punish them, he should use prudence and avoid extremes; otherwise, by rubbing too hard to remove the rust, he may break the vessel. He is to distrust his own frailty and remember not to crush the bruised reed. By this we do not mean that he should allow faults to flourish, but rather, as we have already said, he should prune them away with prudence and love as he sees best for each individual. Let him strive to be loved rather than feared." Apparently prior to Benedict's rule, the theological view was that each person was struggling towards God, and spiritual direction had a very personal aspect to it. Benedict's rule signified a turning point in perception, eventually making the process more regimented than personal. The Rule has further reaching implications as well, being the forerunner to the rule of law and written constitutions, assisting in the shaping of medieval ideas. Benedict's abbey at Monte Cassino was severely damaged by Allied bombing during World War II, having to be rebuilt afterwards. A bit of trivia: author Walter J. Miller was part of the bombing raids on Monte Cassino and was severely affected by them. His dystopian book A Canticle for Leibowitz has echoes of both the monastery and his struggles to come to terms with his part in its destruction. It's a great book, if anyone is looking for a recommendation. St. Benedict: Rules of Humility have stood the test of time. This sounds like a wonderful book for a pensive mood. Trivia: I did not know about the connection to Walter J. Miller, thanks! Humility is something that really needs to be cultivated and practiced. Oh, to be naturally humble! :-) For a very short book, it has many good precepts packed into it! My kids and I just finished reading about Thomas Aquinas, who came long after St. Benedict; however, we read that it was under the care of the Benedictines at Monte Cassino where he grew up and studied for awhile. That's interesting trivia that I didn't know. I really have to read some Aquinas one day, but he's one author who scares the daylights out of me. I would love to live in a monastery or abbey too! So peaceful! We have one close to us where you can do a retreat. Maybe one day! Now that I've done the Anchoress Rule, I should do this! I hadn't either until that Fellowship book. It's that Ancrene Riwle Tolkien didn't quite get around to translating for 30 years or so. Very interesting! I really like the tolernace and love that goes behind the absolute subservience to authority. A very interesting balance! P.S. where do you find these books???!!!! There is balance to it and an obvious note of caring towards their fellow monks. 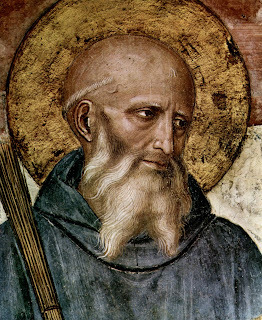 However, I kind of prefer the Desert Fathers, some of whom were temperate and soft and kind, and others of whom were a little crotchety and brusk. They allowed for people's different personalities within their common faith. These books? I find them here, I find them there, honestly I find them everywhere ..... (don't I sound like Dr. Seuss?) But Jean finds tons more eclectic books than me. Really! The Anchoress Rule!? You are right about the desert fathers. I especially loved their description that John Julius Norwich provides of their character and behavior - with their eccentricities and madness and sheer undiluted joy! You do sound like Dr. Seuss! Hahhhaaaa...I agree...The Anchoress Rule takes the top prize! 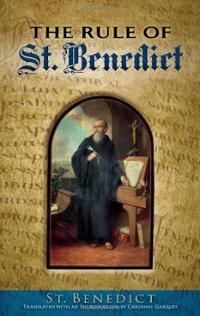 The Rule of Saint Benedict is definitely one I need to get to in the next year. That and Imitation of Christ. The Rule, though written for men, was the basis for most if not all female cloistered communities in the Latin West. Heloise writes to Abelard that aspects are just not suitable for women. That's very interesting, Fariba. Was it ever adjusted to be more suitable for women? You're welcome. It's very short and could probably be read in ½ hour!